By Ross Elliott - posted Tuesday, 5 February 2019 Sign Up for free e-mail updates! Around the world, the vast majority of people are moving to cities not to inhabit their centres but to suburbanise their peripheries. Thus when the United Nations projects the number of future 'urban' residents… these figures largely reflect the unprecedented suburban expansion of global cities. That's from the second line of the introduction to a landmark global study by Alan Berger (MIT's Center for Advanced Urbanism) and Joel Kotkin (Presidential Fellow in Urban Futures at Chapman University), entitled "Infinite Suburbia" (Princeton Architectural Press, New York 2017). The point being that we have confused 'urbanisation' with inner city urbanization. The figures however - should we care to consult them – confirm that for the vast majority of people who say they live in a particular city, that means living in a suburb of that city. This misunderstanding has contributed to cities policy in Australia becoming one sided. Since the advent of the 'Building Better Cities' program under then Federal Minister Brian Howe in the late 1980s, the focus has been on inner city renewal. To a large extent this made sense at the time: inner city areas were run down, with ageing infrastructure and falling populations of residents and workers. In Brisbane, the effective 1990s teaming of Lord Mayor Jim Soorley with Trevor Reddacliff and the 'Urban Renewal Task Force' saw a reversal of fortunes of inner city precincts like New Farm, Teneriffe, and Fortitude Valley. The focus then was very much on inner city precincts and for 30+ years, that's remained the case. The legacy in terms of world class urban renewal is there for all to see (though it's one that few can now afford). In the same period however, suburbs and suburban centres did not receive the same levels of policy interest or infrastructure attention. It became fashionable to view 'the city' as mainly an inner core which was the economic and community frontier of the future. Author and urbanist Richard Florida in The Creative Class more or less defined the case for lavish inner urban investment as central to attracting and retaining talent. (He has since recanted. In his latest book The New Urban Crisis he admits that he got this wrong and that inner cities have become playgrounds for elites at the expense of the majority of - mostly suburban - residents). By contrast, the suburbs were derided by many design, planning and urban commentators as culturally, environmentally and economically inferior forms of urban development. Urban socialist Graeme Davidson in "The Rise and Fall of Marvellous Melbourne" called them "the opiate of the middle classes" (referencing Karl Marx's derision of religion). Melbourne Age columnist Natasha Cica called them "crass over class" and architect Robin Boyd described them as "a material triumph and an aesthetic calamity." "The suburbs are about boredom, and obviously some people like being bored and plain and predictable, I'm happy for them … even if their suburbs are destroying the world." The derision of suburban living or work became a widely accepted norm amongst a clique of self-appointed, largely income-privileged inner city dwellers. The risk for Australia is that this sense of inner urban superiority has found its way unchallenged into public policy at all levels of government and across the political spectrum. As a result we have a policy imbalance where cities policy has through default come to mean "doing things to improve the inner city." This often includes region-wide infrastructure on the basis that its primary purpose is to make it easier for more people to access inner city areas, whether they need to or want to or not. Cities policy needs to be redefined to include suburbs if it is to evolve and provide a more mature and equitable city-wide solution to enhancing people's qualities of life. For the benefit of Elizabeth Farrelly (a resident of Sydney's inner city Redfern) and others with similarly prejudicial views, let's ground truth the reality of Australian cities. So roughly nine out of ten residents of the major capitals are what Farrelly would call "boring" suburbanites out to destroy the world. Boosters might claim that inner urban renewal has seen an explosion of inner city residents because 'that's where most people most want to live.' Yes there has been significant growth, but nothing like the numbers that have settled in suburban regions of the metro area. The graph below shows the change in population over a decade. Another favoured shibboleth of these boosters is the notion that the inner city is where "all the jobs growth" has been and will be into the future. But the evidence doesn't support this. 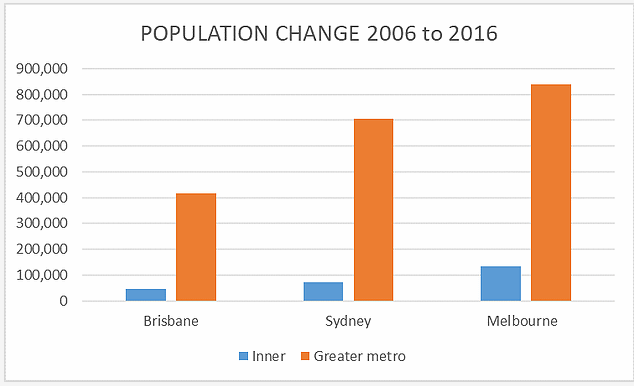 Strong inner city jobs growth has driven much positive change in our CBD skylines but compared with jobs growth across the metro regions, it has been jobs growth in suburban locations that has been the engine room of metro wide employment growth in the ten years to 2016, as the next graph shows. Here's where the policy imbalance comes in. We are a highly urbanized nation but, just as observed in Infinite Suburbia, our urbanisation is chiefly suburban in nature. Roughly nine in ten people who would say they live in Brisbane, Sydney or Melbourne awake from suburban beds each day – not inner urban ones. And roughly 17 in every 20 travel not to inner city workplaces but to suburban ones. Australia's cities policy would do well to reflect this economic and demographic reality. What has been achieved in inner urban renewal and enhanced community infrastructure has been outstanding but it is time to spread the focus wider to be fairer. The quality of life and employment opportunities of future suburban city dwellers – however they may continue to be sneered at by some inner city elites – are just as worthy as anyone else's. If we fail to re-balance cities policy to more accurately reflect where the majority of us live and work, we will risk creating cities of two classes of people, based on geography. This is just as anathema to the Australian tradition of "a fair go" as is a feudal class structure of Kings and Clergy ruling over a peasantry – with positions in the social heirarchy defined by birthright.